Well, who knew a holiday week post on customer service would be so popular? It appears we struck a nerve there, perhaps driven as much by universal frustration with big “service” companies as anything else. To that point, here’s an example of a huge business that completely misses the point. This summer American Airlines allowed flight attendants to give little things to passengers upset about delays or other problems. Frequent flyer miles, drink coupons, seat upgrades, stuff that didn’t cost AA anything but made angry passengers feel that AA cared about the problems the airline caused. Then, some genius at HQ decided this was a bad idea. Every time some bright young marketing executive tried to make American (or some other airline) more responsive, and more quickly responsive to passengers’ dissatisfaction by empowering front-line workers to offer some form of compensation, the bean counters back at headquarters quickly noticed that the cost of such empowerment escalated rapidly. The result, alas, always has been the dramatic reduction or elimination of front-line workers’ authority to solve customer service issues at the point of contact. Instead of fixing the problem, the corporate knuckleheads tried to deal with the fallout – but stopped when it cost too much. This is exactly what killed US manufacturing, autos, and many other businesses. 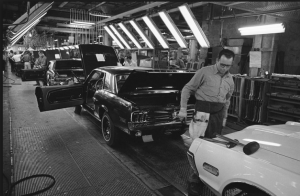 At the end of their assembly lines, GM, Ford, and Chrysler diverted many just-built cars with manufacturing defects to another mini-factory. There, very skilled and very expensive workers diagnosed and fixed cars that had just been built. These guys are yesterday’s American Airlines flight attendants, tasked with fixing problems caused by management. Clearly senior management didn’t understand that if they spent the time and energy and dollars to do it right the first time, they wouldn’t have to a) fix problems with cars they just built, and b) deal with pissed-off customers. Yes, it takes that time and energy and dollars. But the results are measured in customers kept, service problems eliminated, and extra costs avoided. Or, you can just wait for your businesses’ version of Honda to come in and eat your lunch. Find out what your customers want, and do it right the first time. They will love you and reward you for it.